So you have 48 hours in Tokyo with kids. How are you going to spend it? Whether you’re on a quick layover in Japan or trying to squeeze the most out of your time in the city, here is one suggested 2 day itinerary for Tokyo family travel. We lived in Tokyo for 13 years, and I’ve written extensively about things to do in Japan with children, but many people have asked for tips for a short Tokyo visit. Whether it’s a quick layover or part of a larger family Japan trip, many have asked for how to spend 48 hours in Tokyo with kids. I have a confession: that’s a hard request! I went through a lot of variations of the 2 day itinerary for Tokyo travel below, and I might just have to publish a few more plans. It’s impossible — IMPOSSIBLE — to see everything Tokyo has to offer in two days. That said, I’ve thought of several ways to make the most of 48 hours in Tokyo with kids. Here is one of them. I’ve done similar variations of this 2 day Tokyo itinerary, and if you came to visit me, this is where I’d take you during your 48 hours in Tokyo with kids. So how was YOUR 48 hours in Tokyo with kids? Before we begin, let me just say that this suggested 48-hours in Tokyo is…well…ambitious. Especially with little kids. It’s entirely possible to do this entire during 2-day Tokyo itinerary in the time allotted, but please understand that most of these stops could occupy most if not all of your day if you let them. This also requires a lot of walking. Using Tokyo’s amazing train system requires a fair amount of stairs, as well. If you or the kids aren’t used to this, then give yourselves time to rest. Utilize escalators, elevators, taxis and park benches if needed. Okay, now with that out of the way, let’s do this. How I suggest spending 48 hours in Tokyo with kids. For this plan, I’ve divided your 48 hours in Tokyo with kids into two 24-hour halves: one on Tokyo’s east side, and one on its west. They are completely interchangeable. Want to start on the west side? Go for it. Are you ready for the best sushi in the world? Tokyo’s Tsukiji Fish Market is where you’ll find it. Any foodie with 48 hours in Tokyo needs to pay a visit. Now here’s the rub: the Tsukiji Fish Market is an early morning affair, and it ain’t designed for families. That said, it’s worth the early start, and it’s navigable if you plan ahead. I’ve written a detailed post on visiting Tsukiji with kids if you’re interested. If you want to eat by 7am, then you may want to arrive in Tsukiji as early as 5:30am. Here is where jetlag works to your advantage. I’ve had many friends visit me in Japan over the years. If they were interested in sushi at Tsukiji, then I took them the very first morning after they arrived. Most of them were awake already anyway. Want to know how to visit the Tsukiji Market with kids? This all depends on where your hotel is. I recommend staying near the market the night before you go and either walking or taking a taxi to the front. If you take the train, use the Toei Oedo Line and get off at Tsukiji-Shijo Station. There is another station simply called Tsukiji (on the Hibiya Line), but the Oedo Line’s Tsukiji-Shijo Station is closer to where you want to enter the market. Do you want to take the kids to a sumo tournament? You can, and it’s a lot of fun. But what if there’s no tournament happening during your 48 hours in Japan? Do the next best thing: watch a morning training session. There are several sumo stables where practices that are open to the public. Arashio Beya is one of the more well-known ones, and it’s not too far from Tsukiji. Walk to Tsukiji station on the Hibiya Line [color: Gray] and take it north 3 stations to Ningyocho. Then follow the map you’ll find here. Ever wondered what Japan looked like 500 years ago? If so, then the Fukagawa Edo Museum is definitely worth a look. This place is much smaller than the similarly-named Edo Tokyo Museum. That’s a few kilometers north of here, and we’ll get to that later. Instead, the Fukagawa Edo Museum centers around a reconstructed Edo-era village. You can step into houses and touch much of what’s inside. The benches at the top of the stairs can be a quiet place for little kids to rest or nap, as well. A few minutes west of the Fukagawa Edo Museum is the Kiyosumi Garden. This is a small and charming traditional garden. The most beautiful garden in Tokyo is the Shinjuku Gyoen. If you have more than 48 hours in Tokyo, you should definitely visit — especially if you’re in town during hanami season. But you have only 48 hours in Tokyo with kids, so skip Shinjuku Gyoen and view a mini garden instead. Walk around the pond. Feed the fish. Check to see if a tea ceremony or some other event is happening near the water. Need a pick-me-up? This neighborhood has several good coffee shops nearby. Check out ARiSE or Blue Bottle, both about five minutes south of the Fukagawa Edo Museum. Want more about Tokyo’s East Side with kids? Walk over to Hamacho Station and take the Toei Shinjuku Line [color: Light Green] one station west to Morishita station. Get off and transfer to the Oedo line [color: Magenta]. Go One station south to Kiyosumi Shirakawa station. If the Fukagawa Edo Museum interested you, then the Edo Tokyo Museum will be a goldmine. There is much to see here, and plenty to keep kids occupied for an hour at the very least. Read our experience on the Edo Tokyo Museum. Right next door is the Ryogoku Kokugikan, Japan’s main sumo stadium. There won’t be much happening there if a tournament isn’t going on. That said, you still might see a few rikishi (sumo wrestlers) walking around, as many live and train in the area. Walk back to Kiyosumi Shirakawa Station and take the Oedo line [Color: Magenta] two stations north to Ryogoku Station. The Tsukiji Market mentioned earlier is for seafood and related delicacies. On the streets of Ameya-Yokocho (aka “Ameyoko”), you’ll also find fish and traditional food stalls. However, here they stand next to shoe stores, noodle shops, pachinko parlors, and places selling Cinderella dresses. I don’t know what it is about this street, but it has an old-school Japan vibe that’s worth seeing for yourself. Ready for lunch? There are plenty of street-side restaurants in Ameyoko. You’ll easily find ramen, udon, and kaisendon (bowls of rice topped with sashimi — see pic above). Fast food and nicer restaurants are also prevalent. Want more Japanese food options for kids? If you’re looking for something calmer and indoors, then check out Kurofune Tei. This place specializes in yoshoku: Western cuisine that was adapted to Japanese tastes of decades. Go to Ryogoku Station and take the Oedo Line [Color: Magenta] three stations to Ueno Okachimachi station. Ameyoko is 5 minutes walk north. Kurofune Tei is between Ueno Okachimachi Station and Ameyoko. The red gates of the Sensoji Temple are one of the most well-known images of Japan. Walk through these past the stalls and check out the temple grounds. There is plenty to do and see in Asakusa, but with only 48 hours in Tokyo with kids, you will have to be the judge of how long you linger. Next to Ueno-okachimachi station is Ueno-Hirokoji Station. Take the Ginza line [color: Yellow] from here four stops to Asakusa Station. Follow the signs (and crowds) from there. Want more fun in Asakusa? After the crowded streets of Tsukiji and Asakusa, now it’s time for some open space to run. The Odaiba area is built on man-made islands in Tokyo Bay, and you could keep your family occupied for days here. Even getting to Odaiba is fun — more on that in the directions. There are lots of fun things to do in Odaiba, but with 48 Hours in Tokyo with kids, I’ll just share a few of them. Sitting along the waterfront are two buildings: the Decks Tokyo Building in front of the beach and the Aqua City Building a little further down. Here you’ll find a trick art museum, a Science museum backed by Sony, and a Lego Discovery Center. Pick one or two of these, or choose from my other recommendations. Or just walk around the well-manicured grounds. There are two main ways to get from Asakusa to Odaiba. Both will take you between 45 minutes to an hour, but either may be the most interesting transit of your 48 hours in Tokyo. By boat. You can take a waterbus down the Sumida river and under a number a bridges all the way to Odaiba. This ride is often a hit with kids. It can also be a good spot for children to nap for a half hour or more (the journey takes 50 minutes). If you’re making the most of 48 hours in Tokyo with kids, you’ll need to plan on some time for rest. Go back to Asakusa Station and take the Asakusa Line [color: Red] or the Ginza line [color: Yellow] to Shimbashi Station. Both take more of less the same time. Follow the signs to the Yurikamome Monorail and take this to Odaiba-Kaihin Koen Station. Make sure to get on the front of the train, even if you have to wait for the next train. The view is great! Want more info on Odaiba with kids? Is it time for dinner yet? Odaiba is full of restaurants. We love Odaiba’s yakiniku restaurants like Daigo in the Decks building and Heijouen in Aqua City. For something cheaper and more casual, try the ramen city. If you want something more familiar, there’s a Sizzler in Aqua City as well, along with dozens of other restaurants serving Italian, Chinese, Indian and more. If possible, take the monorail back to town. Sit in the front car and watch the city lights pass by. If your hotel is in the Shinagawa or Shibuya area, then the Rinkai (line might be faster. It’s underground so less interesting, but will get you back faster. We’re halfway through our 48 hours in Tokyo with kids. Hopefully you slept well last night, because we have a lot more to see and do today! Not many family travel blogs give that kind of advice, I’m sure. But hey: this is Japan, and you might be surprised at how good Japan’s “junk food” really is. Seek out a convenience store like 7-11, Sunkus or Family Mart. They’re everywhere. In most of these you can find soft white bread sandwiches, coffee, pastries, and best of all: onigiri. What’s an onigiri? These are the balls of glutinous rice pressed into triangles, disks and tubes and wrapped with nori seaweed paper. Inside you’ll find all sorts of goodies. Make sure to pick up a few snacks for the day while you’re there! And read my other post about Japanese food your kids will love. Keen for a hot meal? Then it’s time to find a bowl of gyudon. Chains like Yoshinoya and Matsuya serve it all over the city, along with other typical Japanese breakfast food. If you’re looking for a good Japanese breakfast near Tokyo Station, go to Hatsufuji near the Yaesu exit. 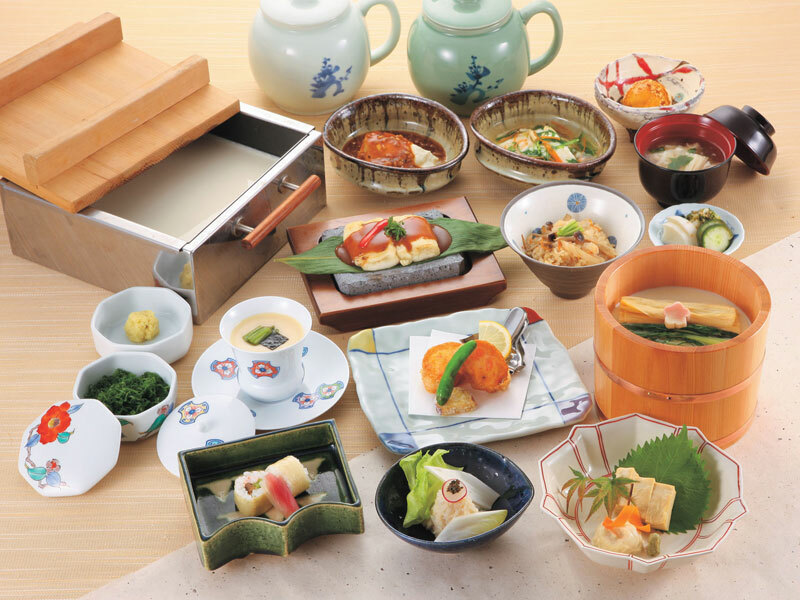 Here you can find nice grilled salmon with rice, good tofu and other Japanese breakfast items. Be warned that smoking is allowed in this place. And don’t expect any English speaking staff or English on the menu. Have I scared you off? No? Good. Try it out. If not, check the options above. No matter your age or interests, there is one place that I recommend to everyone: the Ghibli Museum. This museum does many things at once. It relays the art and science behind animation. It also details the inspired life of Hayao Miyazaki, the creator of some of Japan’s most famous animated movies of all time. Have you seen films like Spirited Away and My Neighbor Totoro? If you haven’t, get them now. If you’ve seen them, then you’re really going to love this place. The building itself is an amazing experience to walk through as well. The closest station is usually considered Mitaka, but I suggest getting off the train early at Kichijoji station and walking through the park to the Ghibli Museum. This goes double if visiting on a weekend. Inokashira Park is a beautiful place, and often quite lively on Saturdays and Sundays, when buskers and flea market stalls set up shop under the trees. Entry tickets for the following month go on sale from 10:00am (Japan time) on the 10th of each month. For example, if you want to get a ticket for Mid-June, you will need to book it after May 10th. Tickets sell out fast, so plan accordingly. Give yourself enough time to walk through the park and arrive at the Ghibli Museum on time. It takes a family 15-20 minutes to walk straight through Inokashira Park, without stopping. If you pause to listen to a busker, feed the ducks or rent a paddleboat, you could run late. Perhaps hit the park on the way back? If going straight to Mitaka Station, then take the Chuo line [color: Yellow or Orange, depending on if it’s an express or not]. Another option is to get off at Kichijoji Station and walk through the park. You can reach Kichijoji Station by either the JR Chuo line or the Keio Inokashira line, which originates in Shibuya. There are plenty of food options in Kichijoji. Here are my two favorites. If you want cheap and cheerful yakitori, we love Iseya. Unfortunately, so do many, many others, and it can be quite crowded if you arrive at peak time. This place ain’t fancy, and it can also get quite smoky inside. If this puts you off, then try the takeout window. Interested in something more sophisticated? Head to Umenohana on the 9th floor of the Tokyu Department Store. Umenohana specializes in tofu, but the meal is far from vegetarian. They have a number of courses to choose from, and they almost always include meat, chicken and sashimi as ingredients. Choose tatami room service for your own private space, personal service, and an experience to remember. Anyone with 48 hours in Tokyo with kids wants to see Shibuya scramble. What’s Shibuya scramble? This crowded intersection has become a famous symbol of urban Japan. You’ve probably seen the postcard, or perhaps images of it on Youtube or in movies like Lost in Translation. This entire neighborhood is fun for a walk, but you can be forgiven for just stopping by to see the bustle and snap a pic or two. If you have more than 48 hours in Tokyo with kids, then make sure to see it at night, as well. While you’re there, you can stop to see a small statue of a dog named Hachiko. The story goes that Hachiko waited at the Shibuya train station every day for his master to return from He did this for years. Eventually, his owner got old and died, but Hachiko continued to come to the station every day to wait for him. The story is more interesting than the statue itself, but it’s worth seeing and telling your kids about it. Also, the statue has become a de-facto meeting spot for people in Shibuya, so it can be fun to see who’s milling around the small bronze dog, and ponder why. The premise of this post is how to spend 48 hours in Tokyo with kids, but if you had only 24 hours, I might recommend this area because of the variety of Tokyo experiences it presents. Start with the shrine. Meiji Jingu is one of the most well-known and significant Shinto shrines in the country. Walk down these wooded paths and it’s easy to forget you’re in the center of one of the biggest cities in the world. After leaving Meiji Jingu, head back toward the station and cross the road, take a left and walk down the hill to Takeshita Dori. Stroll this bizarre street of shops and boutiques famous for it cute and bizarre items, then hang a right. Here, the Omotesando boulevard is full of high-street shopping, galleries, people watching, amazing architecture and more. Looking for more on Harajuku and Omotesando? Enter Shibuya Station and look for the JR Yamanote Line [color: Light Green]. Take the Yamanote Line one station north to Harajuku Station. Step through the National Art Center and into the Roppongi district. Stop in a gallery if there’s something kid-friendly worth seeing, but move on if not. There are a number of art opportunities here — most notably at 21_21 Design Sight. But your goal here is to walk through Roppongi’s Art Triangle and end up at the Mori Building. The Mori Museum is on the 35th floor, and is an amazing space. Many of their traveling shows are great to experience with kids. However, even if you choose to skip the exhibits, your goal now is to visit the Tokyo City View observation for the view of Tokyo at sunset. Fortunately for you, the Tokyo City View admission is part of the Mori Museum price. Take the Chyoda Line [color: Dark Green] from either Meiji-jingu Mae station or Omotesando Station. Two stops to Nogizaka Station and follow the signs to the National Art Center Entrance. Walk through this building (linger if you like) and then follow signs to Tokyo Midtown or Roppongi Hills. Want more things to do in Roppongi with kids? Roppongi is full of dining options, but I’ll give you two. The most popular option is Gonpachi. This izakaya-style restaurant was made famous as the backdrop for some of Quentin Tarantino’s film “Kill Bill.” The food is good, the menus are in English and the environment is lively, sophisticated, cosmopolitan, and non-smoking (still special in Japan). It is priced accordingly. Want something a little more local? Then walk or cab it over to Uoshin Nogizaka for an authentic Japanese fish experience. If you missed the trip to Tsukiji and want your fill of sushi in your 48 hours in Tokyo with kids, this is the place. A warning: many of the interior rooms here get quite hazy. Request the non-smoking or outdoor tables when (or even before) you arrive. Where did you go? What did you do? Did you follow my advice? Or do you have your own tips for how to spend 48 hours in Tokyo with kids? Let me know in the comments, or contact me directly! Thanks Jeff. Everywhere has something good to offer. Where will you go next? Wow! Luckily we have more then 48 hours in Japan so can space some of this out. THANK YOU for making my research easy, as I think we will simply follow this to a tee! I’d like to write some more itineraries and improve on this one as needed, so let me know how it goes! I totally agree that the fish market is a great experience – we arrived around 8am and still managed to have a good walk around the market before they packed everything up, and then had some absolutely amazing (and expensive) sushi – and aw some interesting stuff like whale ice cream :(. We also had some experiences like going to a sumo wrestling tournament and seeing a baseball match which were great fun (and can I say ‘theme park’)! I haven’t written about baseball games yet. I totally should. They’re so much fun, and the fan interaction is like nowhere else!